For anyone who is interested in astronomy, I would strongly encourage contacting the local astronomy club (and there is one just about everywhere nowadays). There is no replacement for real life experience and collaborating with real, live people. Learning how to use astronomy equipment, proper observing etiquette, and the common speak of amateurs is best done in the group setting. However, the pointers in this article can really help you get started in self-education and building your own amazement. This blog post presents a few of the easiest resources to access to get one’s journey underway. If you live in a place like I live, which encounters an abnormal amount of night time cloud cover, or maybe you live in a light polluted area where the sky’s offerings are partially drown out, how does one learn the night sky on their own? The answer – Planetarium Software. This kind of software presents the user with a full sky experience, and includes names, descriptions, and other data associated with Constellations, stars, planets, nebula, galaxies, clusters, and other objects. There are various offerings out there, both free and for purchase, and many of these software programs are amazing! Below are two offerings which can be downloaded free of charge. Stellarium – http://www.stellarium.org/ – This is probably the best freely downloadable planetarium software available. An amazing effort put forth by the creators of this software. It is available for Windows, Mac, as well as many Linux variants. It’s features include a 3D realistic sky, 600,000 star catalogue, the planets and their satellites, the complete Messier Catalogue (110 deep sky objects), other deep sky catalogues and full featured time controls. The developers also present a User Guide as well as a full featured wiki for helping folks who are just getting started. A great offering! Google Sky – http://earth.google.com/sky/index.html Google’s Earth software comes with a feature known as “Google Sky” embedded within it. Once you have installed the Google Earth software, simply click on “View” then “Explore” and select “Sky.” And a full featured all sky view will be presented to you. This software also offers the same object catalogues, images, and other features as Stellarium with respect to viewing the night sky. However, the one thing Google Sky lacks is an intuitive way to display the sky as it appears from your location, at the time you want to specify. However, it is still a great resource for viewing information, learning object locations, etc. Again, Google Earth/Sky is supported on an array of operating Systems. Wikisky.org – http://www.wikisky.org/ – An online resource that allows you to search for night sky objects. Worldwide Telescope – http://www.worldwidetelescope.org/ – Microsoft’s freely downloadable planetarium software for Windows based computers. Lots of features, images and capabilities are offered. Very entertaining way to view the sky. The Sky – http://www.bisque.com/sc/ – Software Bisque’s planetarium can be purchased to provide a wide array of astronomy functions. There are various products for different levels of amateur and professional astronomy. Starry Nights – http://www.starrynightstore.com/ – Another software package that can be purchased, and again they offer a wide array of functions and support form different levels of astronomy. Don’t have a telescope – SLOOH.com has quite a few! If you are curious to see LIVE images of cosmic origin through a telescope, but do not have a telescope of your own, then you may want to check out www.slooh.com. They have an array of pricing plans. Missions are executed throughout the day from three observatories located in the Canary Islands, Chile, and Australia. 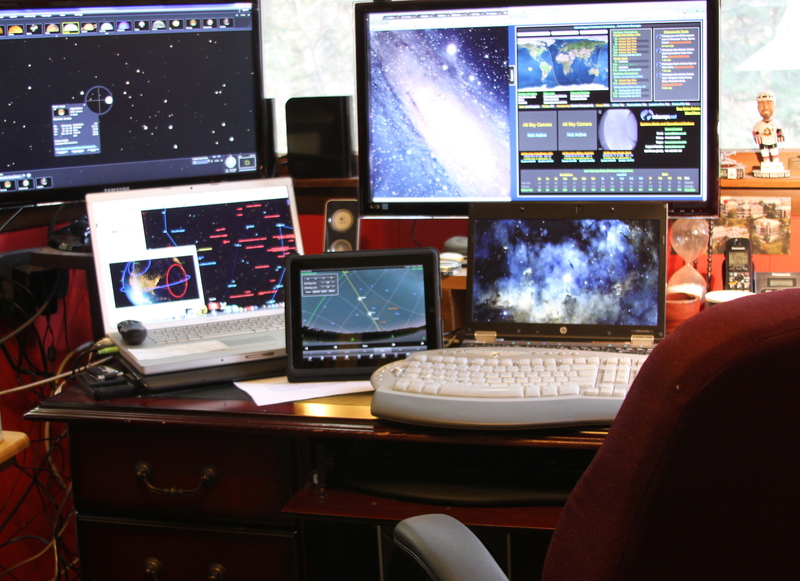 Each observatory has two telescopes, one dedicated to an automated list of objects, and the other can be reserved for specific missions defined by the user community. The way SLOOH works, is that CCD Cameras are attached to each telescope. The telescopes are fully automated, and the user interface delivers images of the targets to the user. A great concept, and an excellent armchair astronomy tool for those who may not have full time access to equipment or the proper sky conditions. There are other similar services to SLOOH that require a bit more technical savvy, including the excellent Global Rent A Scope operation – http://www.global-rent-a-scope.com/. This service also includes observatories from around the World, and offers you the chance to use their observatories from around the world, and offers equipment to take your own photos. You perform your own photo image post-processing, and GRAS just delivers you the equipment, and the means to collect the data. This service is for those who are interested in astrophotography, but do not have the resources to take pictures of deep space objects. Again, there is an array of different pricing plans, and some self-education is required to utilize the tools offered. I have been using GRAS for about three years now, and it has provided me with an excellent observational toolkit. Once you have a planetarium software package, and are able to use it – you will rapidly start learning the night sky. Eventually you will want to know what something “really” looks like. At that point, this is where you will switch over to Google Images. Bring up the Google Search home page, and then click on the “Images” menu selection. Next type in an object name, lets say M31, click search, and ~149,000 image results will be returned to you. Just about every amateur astro-photographer posts his/her photos on the web somewhere, and the professionals do as well. 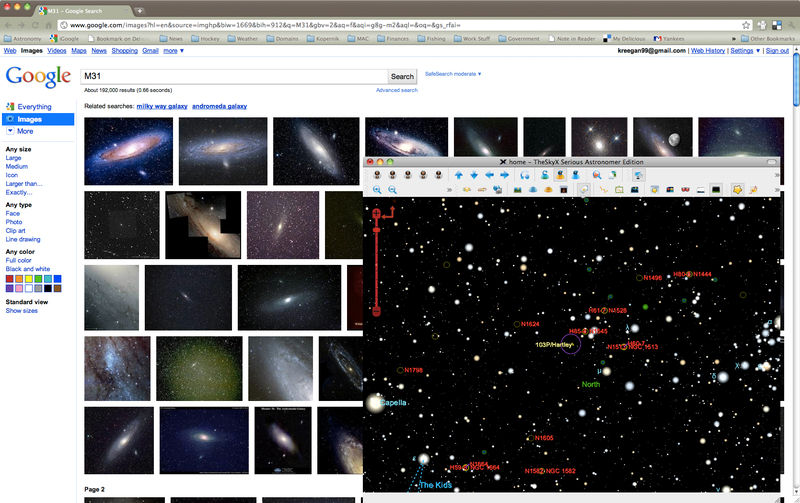 Eventually Google indexes all these, and you have world’s largest astro-photography database at your fingertips. It is simply amazing the number of results that get returned for even the most obscure deep sky objects. How Do I Know What Things Would Look Like Through a Telescope? One of the disadvantages of the photographical view of the sky, is that it does not match what you would see through an eyepiece in a telescope. If this is what interests you, then there is another site out on the interwebs that presents sketches that folks submit. Astronomy Sketch of the Day presents sketches that are mostly what people have seen through their telescopes. ASOD is a great resource to know or verify what you are seeing through the telescope. The web address is: http://www.asod.info/. The Internet has revolutionized amateur astronomy pursuits over the years. There are thousands of blogs to choose from, and hundreds of astronomy clubs have an online presence these days. Just go to Google, and try the following searches: “Astronomy Blog”, “Astro Club”, and “Astro Society.” You will find each search brings back millions of hits. Some of these resources are very good. These few web sites should help you open up your online pursuits of amateur astronomy. Of course not forgetting the power of social media in finding resources, Twitter can be an amazing resource for news, information, and other collaboration. Starting with folks that you can find on the Space Tweep Society will aid in your transition of finding other Tweeps with similar interests as yours. Tying these resources in with your local astronomy club’s efforts and events will help to bring you up to speed in no time, and provide you with a way to pursue the hobby when skies are cloudy or the weather frightful!